George Harris, 87, from Sidmouth, Devon, is urging other World War Two veterans to apply for Heroes Return funding to make a first or second visit to where they served. He visited the Bay of Genoa area in Italy in October 2012, returning to one of the many places in the west Mediterranean he stopped at while on board a minesweeper. George joined the Royal Navy Coastal Services aged 17 in April 1943. Following training on lochs in Scotland, he joined a troop ship in a convoy to Malta. He then joined ML134 – a motor launch adapted to be a minesweeper. 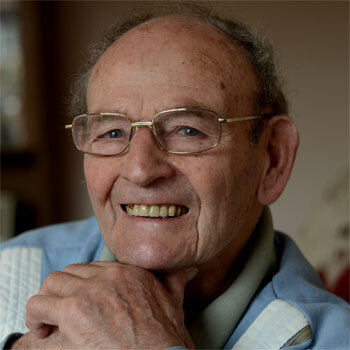 The Able Seaman was a gunner on board the craft which swept mines from the sea to make way for larger Allied shipping. He said: “We would tow metal cables behind us that would sweep just under the surface. The cables would slice through a mine’s mooring cables and it would float to the surface. “I was a gunner on the bow and when it came to the surface I would shoot at it from a safe distance. If you hit one of the horns that stuck out it would explode. If I didn’t hit a horn then eventually the mine would get so pumped full of shells and water that it would sink to the bottom. “One time we were sweeping somewhere off La Spezia and Genoa in Italy and a German Tiger tank began from the shore at our flotilla. Luckily we were too far away for him to hit us. Sometimes US bombers dropped bombs into the bay – perhaps they thought we were Germans. “One day we heard that a US Liberator had gone down and we were asked to look for it. We spotted a huge inflatable life-raft and thought we’d found them – but it was empty. “I wasn’t in any real danger during the war and it was actually a wonderful part of my life. There were 18 of us on board the motor launch – that was it. We went all around the West Mediterranean – Corsica, Sardinia, Santa Margarita and off the south of France. We were together for a whole year. They were such lovely blokes. I was the youngest on board – most of the others were in the late 20 or maybe early 30s. I expect they will have passed away by now.